A further development of the P-43 Lancer featuring a more powerful Pratt & Whitney R-2180 engine. Development was discontinued due to the decision of the Republic Aviation Corporation to focus on building a more promising P-47 fighter. The XP-44 Rocket is an American tier V multirole. 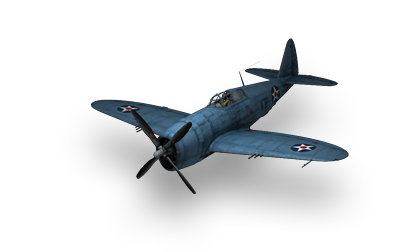 In comparison to the F4F wildcat, it shares similar traits. It has the same armorment, with six .50mg's once upgraded. It's main strength is the massive health pool available. The XP-44 has even more health than the already healthy F4F. Use this to your advantage when fighting. You can survive multiple fights and wait for more maneuverable fighters to come help. Its speed is another strong point, only 9 KPH slower than the really fast FW 190. Use this speed to catch enemies or run away. Coupled with the high altitude performance it possesses, chasing after fighters is a good strategy. Its downsides are its guns and maneuverability. The six .50 MG's have a good fire rate but do not have the punch of the 20mm cannons. They do not overheat easily, so sustained fire is a good strategy. This is the heaviest Multirole at tier V, so it is expected to be a bit sluggish. Being outmaneuvered at low altitudes can be frustrating. Use your 500lb bombs to take out enemy AA and other installments. Use your speed to close in on enemies and open fire with your guns. Stock grind can be a pain but once you get past it, this plane becomes decent enjoyable. This page was last modified on 7 February 2018, at 20:50.